Sorry for the lack of posts of late, I've been uber busy now that my little one is on the move walking but I will be back with posts very soon! In the mean time I have a great post from one of my favourite bloggers: Iqra of The Blushing Giraffe. Hello Frootibeauty readers! Can I just say what an honour it is to be guest blogging back on the lovely (and super talented) Safiyah’s blog. 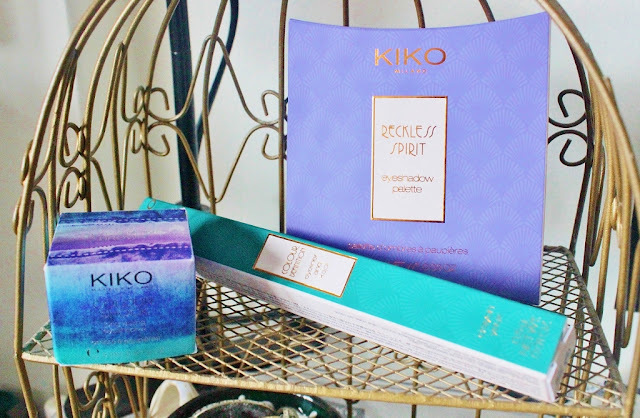 She kindly sent me a few Kiko goodies to review for you all so lets get started. I believe two of these are from the Rebel Romantic collection which is limited edition this autumn - the eyeshadow palette in the pretty purple box and the eyeliner in that stunning green box. The cute multicoloured square box houses one of Kiko’s colour shock long lasting eyeshadows and the moment I opened the surprise package I was so excited to try them all out! Unfortunately the postman came mid-way through me doing my makeup for a wedding so I couldn’t delve in and experiment..but a week later I am ready to give you my thoughts. The first thing that I tried is the Kiko Milano Reckless Spirit Eyeshadow Palette in 03 Wonderful Mauve (£12.90) which is a cool toned quad of matte shadows. 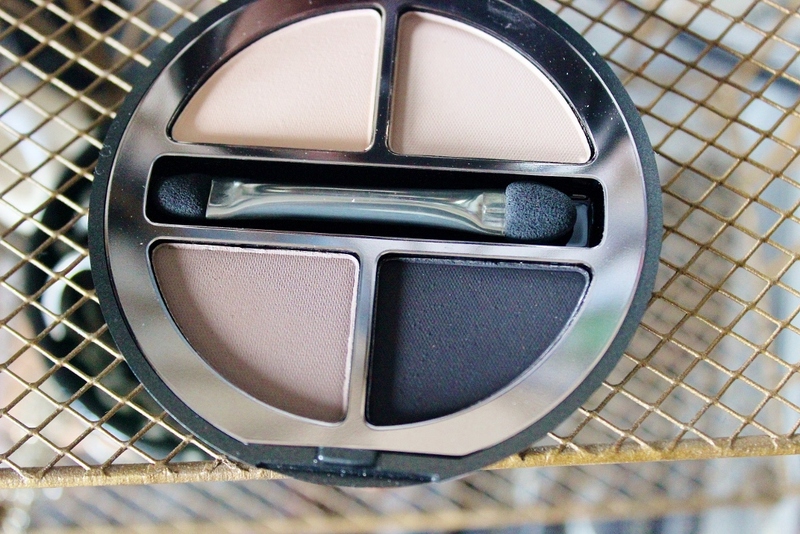 I normally gravitate towards warm eyeshadow colours so it was really refreshing to play with the taupe's and greys. When I first swatched the eyeshadows I was a little disappointed at the colour payoff, however used over a base on the lids I found it showed up better and didn’t take as much building up as I had anticipated. I love the nudey-beige shade, it’s great base for everyday and both the grey/taupe colours work well to add definition in the crease area. The black shade is surprisingly the most pigmented with one swipe, so it’s easy to add some depth and smokiness to your look if you want too! 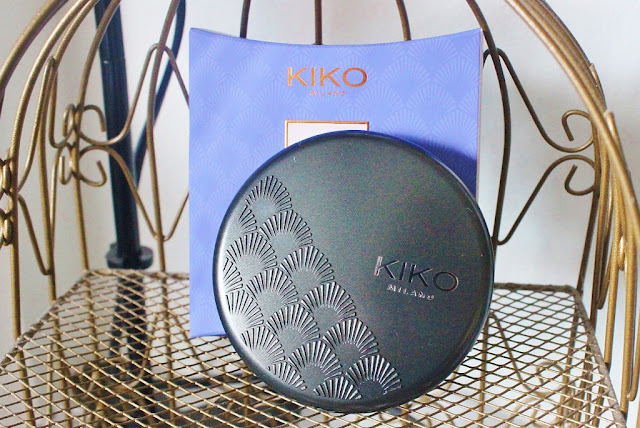 The packaging is very sturdy with a pretty design on the front and size wise, is a little smaller than a powder compact with a full sized mirror on the inside - making it very travel friendly. It also comes with a mini duo doe foot applicator. All in all a decent eyeshadow palette, if a little pricey, but it’s worth checking out if you’re a neutrals kind of girl. 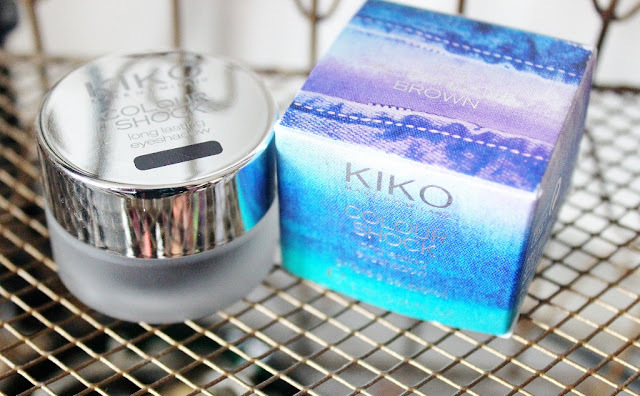 Moving on to the Kiko Milano Colour Shock long lasting eyeshadow in 103 Alternative Brown. I assume this is very similar to their cream crush lasting colour eyeshadows only with 1g more product. The cute little pot with frosted glass houses a cream eyeshadow formula which looks remarkably similar to the Charlotte Tilbury ones! It is a moose/whipped type of formula which feels very light on the eyes and blends well. You can pack this on for an intense colour pay-off or you can use a light wash of it all over the eye, depending on what look you’re going for. My favourite way to use this is actually like a gel liner, though the texture isn’t similar to one at all, I find with a small brush it is easy to line the lids and it makes a nice change from an intense black wing. In fact it gives a sort of smoky look to the eyes. 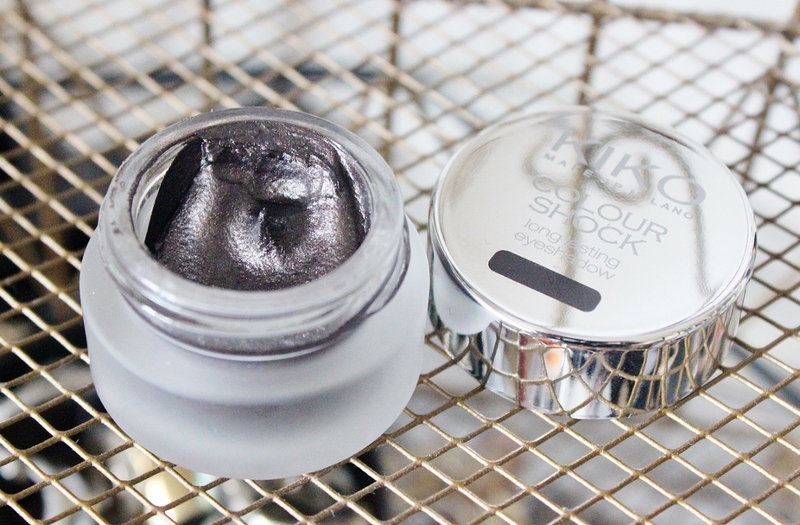 The shade looks like a gunmetal grey in the pot but transfers as a cross between black and brown with very subtle speck of shimmer. After using this I’m tempted to pick up some of their matte versions and some lighter ones too. I think it’s great value for money as a little goes a really long way. Last but certainly not least we have the Kiko Colour Definition Eyeliner and Kajal in 05 Splendid Emerald. 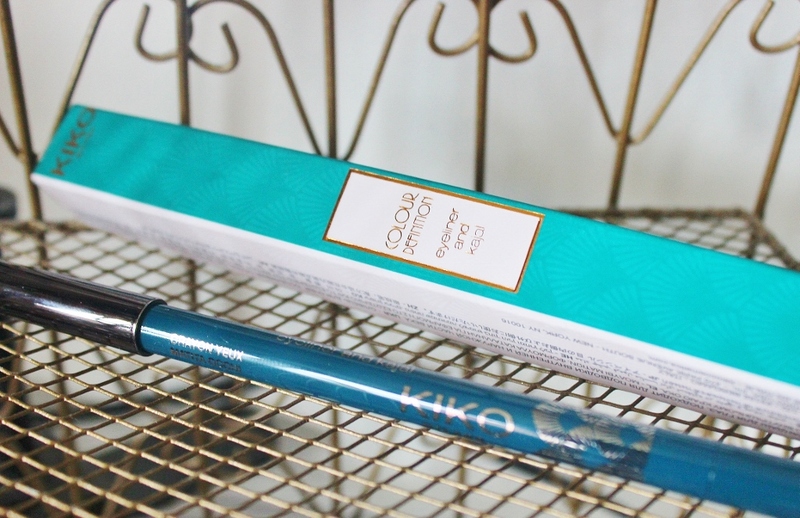 Green eyeliner is not a colour reach for on a regular basis, but after using this pencil I’m going to push myself out of my comfort zone because WOW does it make brown eyes pop! 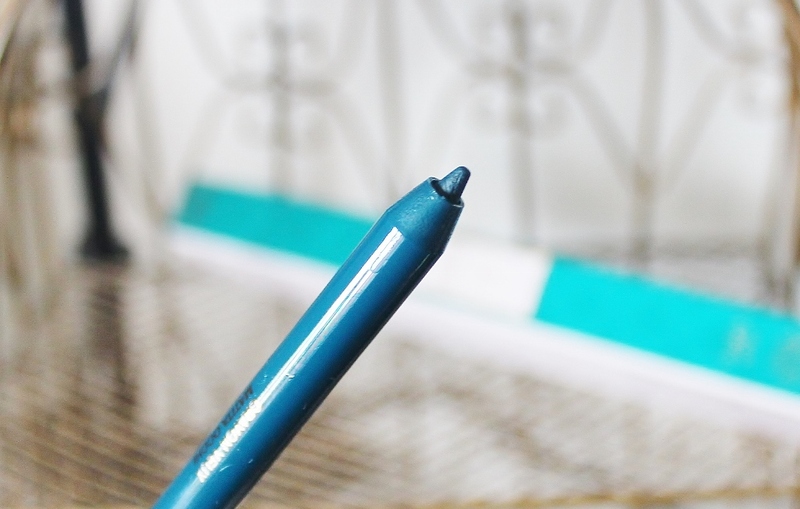 Very pigmented, thin nib, twistable so no need for sharpeners and it even has a tool which you can use to make the end pointy again. I really want to get my hands on the beige shade as I think it’ll be perfect for the waterliner and overall the quality of this pencil really impressed me. I found it easy to line my top lid as well as my waterline and my lowerlash line. The waterline did take a few swipes to build colour but that’s usually expected. Swatches of everything are below, please note the liner is a lot more of an emerald green than the photo suggests! Just heads up, Kiko currently have an offer of a BB Lip Glaze 07 Poppy Red for £2.90 instead of £6.90 (code BEAUTY1) till the 4th of October! So if you fancy anything in this post, there’s your excuse! Could you suggest me some best to tips to use the eye pencils in an better and attractive way.